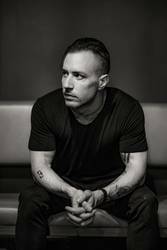 Greg Puciato, vocalist of groups The Black Queen and The Dillinger Escape Plan, will release a book titled Separate the Dawn next month, on Feb. 12. The book is a collection of poetry and photography that was mostly completed during The Dillinger Escape Plan's final year and a half. The book is to be released on Federal Prisoner, a new label/publishing house that also released The Black Queen's Infinite Games last year. This is the heaviest and most brutal, but ultimately positive and necessary piece, in a series of thematically connected output for me, during what I now see as a long transitional arc, of realization, processing, shedding, accepting, and then finally coming out of the other side into a different place. A walk through a broken mirror. Chronologically this goes after Dissociation, and before Infinite Games. It's also a surprising and welcome reconnection with a medium that was my first creative love, even before music, and an equally surprising fascination with a new one. I guess it's essentially my fist (and maybe only) solo release. Thanks to everyone who picks this up, for continuing to encourage me to keep creating with zero regard for parameters of gene or medium. Also, Lebron James is not greater than Michael Jordan. The Black Queen will tour Australia next week, and North America in the spring.